Non-contiguous finished genome sequence and description of Bacillus algeriensis sp. nov.
Strain EB01T sp. nov. is the type strain of Bacillus algeriensis, a new species within the genus Bacillus. This strain, whose genome is described here, was isolated from sediment sample of the hypersaline lake Ezzemoul sabkha in northeastern Algeria. B. algeriensis is a facultative anaerobic Gram-positive bacillus. Here we describe the features of this organism, together with the complete genome sequence and annotation. The 5,269,577 bp long genome contains 5,098 protein-coding and 95 RNA genes, including 12 rRNA genes. Bacillus massilioalgeriensis sp. nov. strain EB01T (= CSUR P857 = DSM 27334) is the type strain of B. massilioalgeriensis sp. nov. It is a new Gram-positive, facultatively anaerobic, motile, indole-negative, rod shaped bacterium with rounded ends. It was isolated from a sediment sample from the hypersaline lake Ezzemoul sabkha in the Oum-El-Bouaghi region in northeastern Algeria, which is an important wintering and resting site for several species of waterbirds, including the Greater Flamingo. This site is one of the Ramsar convention wetlands (http://www.ramsar.org). The genus Bacillus was created by Cohn about 142 years ago , and mainly comprises Gram-positive, rod-shaped, aerobic or facultatively anaerobic, spore-forming bacteria. The genus includes 279 species and 7 subspecies with validly published names . Members of Bacillus genus are ubiquitous in nature, ranging from freshwater to marine sediments and from hot springs and desert sands to Arctic soils; many strains have been isolated from the gastrointestinal tracts of various insects and animals, from vegetation and from food . Bacillus strains are biotechnologically priceless because of their high capacity to produce a wide range of antimicrobial compounds, enzymes and other metabolites that can be used in industry [4,5]. Some species of Bacillus are pathogenic, such as B. anthracis (responsible for causing anthrax)  and B. cereus (a major cause of food poisoning) . Others are opportunists in immunocompromised patients, and may also be involved in various human infections, including pneumonia, endocarditis, ocular, cutaneous, bone or central nervous system infections and bacteremia .The current bacterial taxonomy is based on a combination of various phenotypic and genetic criteria [9,10]. However, the three essential genetic criteria that are used, comprising 16S rRNA gene based phylogeny , G+C content, and DNA-DNA hybridization [10,12] exhibit several drawbacks. As a result of the recent decrease in the cost of genomic sequencing, it has been proposed that whole genome sequencing information and MALDI-TOF spectrum  be combined with the main phenotypic characteristics as a polyphasic approach strategy (taxono-genomics) to describe new bacterial taxa [14–26]. Here we present a summary classification and a set of features for B. massilioalgeriensis sp. nov. strain EB01T together with the description of the complete genome sequence and annotation. These characteristics support the circumscription of the species B. massilioalgeriensis. In July 2012, a sediment sample was aseptically collected in sterile bottles, 15 cm below the evaporite crust of the hypersaline lake Ezzemoul sabkha of Oum-El-Bouaghi region in northeastern Algeria. Samples were transferred in a cooler (4°C) to our lab in Algeria. Samples were processed the same day. Sediments were diluted 1:10 v/v with sterile saline water (0.9% NaCl) and vigorously shaken, Tenfold serial dilutions (10−1–10−5) of the sediment suspension were plated in Nutrient Agar (NA) medium (meat extract 1 g/l, peptone 5 g/l, yeast extract 2 g/l, sodium chloride 5 g/l, agar 15 g/l) and the plates were incubated at 30°C for 24–72 h. In order to obtain a pure culture, colonies were transferred to fresh NA medium. Bacillus massilioalgeriensis sp. nov. strain EB01T (Table 1) was isolated in July 2012 by cultivation under aerobic conditions at 30°C. This strain exhibited a 97.0% 16S rRNA nucleotide sequence similarity with Bacillus subterraneus type strain DSM13966T (Figure 1), the phylogenetically closest validly published Bacillus species. These values were lower than the 98.7% 16S rRNA gene sequence threshold recommended by Stackebrandt and Ebers to delineate a new species without carrying DNA DNA hybridizidation . A consensus phylogenetic tree based on 16S rRNA gene sequence comparisons, highlighting the position of strain EB01T Bacillus massilioalgeriensis relative to other type strains within the Bacillus genus. GenBank accession numbers are displayed in parentheses. Sequences were aligned using CLUSTALW, and phylogenetic inferences made using the neighbor-joining method  within the MEGA 5 software . Numbers above the nodes are percentages of bootstrap values from 1,000 replicates that support the node. Paenibacillus polymyxa was used as the outgroup. The scale bar represents 0.01 substitutions per nucleotide position. aEvidence codes - IDA: Inferred from Direct Assay, TAS: Traceable Author Statement (i.e., a direct report exists in the literature), NAS: Non traceable Author Statement (i.e., not directly observed for the living, isolated sample, but based on a generally accepted property for the species, or anecdotal evidence). These evidence codes are from the Gene Ontology project . If the evidence is IDA, then the property was directly observed for a live isolate by one of the authors or an expert mentioned in the acknowledgements. Six different growth temperatures (25, 30, 37, 45, 50 and 55°C), nine NaCl concentrations (0, 2.5, 5, 7.5, 10, 15, 20, 25, 30%) and ten pHs (5, 6, 6.5, 7, 7.5, 8, 8.5, 9, 10, 11) were tested. Growth occurred at all tested temperatures, however the optimal growth was observed at 37°C, between 0% and 2.5% NaCl concentration and pH in the range of 6.5–9 (optimum at pH 7). Colony morphology was observed on sheep blood agar (BioMerieux) after 24 h of aerobic incubation under optimal growth conditions, the colonies of strain EB01T were circular, light yellow, smooth and 2 mm in diameter. Growth of the strain was tested in anaerobic and microaerophilic atmospheres using GasPak EZ Anaerobe Pouch (Becton, Dickinson and Company) and CampyGen Compact (Oxoid) systems, respectively, and in aerobic atmosphere, with or without 5% CO2. Growth was achieved under aerobic (with and without CO2) and microaerophilic conditions but weak growth was observed under anaerobic conditions. Gram staining showed Gram-positive rods (Figure 2). Cells grown on agar sporulate. A motility test was positive. The size of cells were determined by negative staining transmission electron microscopy on a Technai G2 Cryo (FEI) at an operating voltage of 200 kV, the rods have a length ranging from 2.4 µm to 4.9 µm (mean 3.6 µm) and a diameter ranging from 0.7 µm to 1.1 µm (mean 0.8 µm) (Figure 3). Gram stain of B. massilioalgeriensis strain EB01T. Transmission electron micrograph of B. massilioalgeriensis strain EB01T made using a Technai G2 Cryo (FEI) at an operating voltage of 200 kV. The scale bar represents 500 nm. Strain EB01T exhibited catalase activity but oxidase activity was negative. Using the commercially available API 50CH system (BioMerieux) according to the manufacturer’s instructions, a weak positive reaction was observed for D-ribose, D-glucose, D-fructose, methyl α-D-glucopyranoside, N-acetylglucosamine, D-maltose, D-lactose, D-melibiose, D-saccharose, D-trehalose, D-tagatose, and hydrolysis of starch. Other tests were negative. Using the API ZYM system (BioMerieux), positive reactions were observed for alkaline phosphatase, esterase (C4), esterase lipase (C8), leucine arylamidase, α-chymotrypsin, β-glucuronidase, α-glucosidase, N-acetyl-glucosaminidase and a weak positive reaction was observed for acid phosphatase. The nitrate reduction and β-galactosidase reaction was also positive, but urease and indole production were negative. B. massilioalgeriensis was susceptible to amoxicillin, nitrofurantoin, erythromycin, doxycycline, rifampicin, vancomycin, gentamicin, imipenem, trimethoprim-sulfamethoxazole, ciprofloxacin, ceftriaxone and amoxicillin-clavulanic acid, but resistant to nalidixic acid. When compared to other Bacillus species [40–48], Bacillus massilioalgeriensis sp. nov. strain EB01T exhibited the phenotypic differences detailed in (Table 2). Differential phenotypic characteristics between B. massilioalgeriensis sp. nov. strain EB01T and phylogenetically close Bacillus species†. †(Bacillus subterraneus strain COOI3BT, Bacillus foraminis strain CV53T, Bacillus jeotgali strain YKJ-10T, Bacillus thioparans strain BMP-1T, Bacillus boroniphilus strain T-15ZT, Bacillus bataviensis strain IDA1115T, Bacillus nealsonii strain FO-92T, Bacillus kribbensis strain BT080T). B. massilioalgeriensis (B. ma), B. subterraneus (B. su), B. foraminis (B. fo), B. jeotgali (B. je), B. thioparans (B. th), B. boroniphilus (B. bo), B. bataviensis (B. ba), B. nealsonii (B. ne) and B. kribbensis (B. kr). +: positive result, −: negative result, var: variable, w: weak positive result, na: data not available. Matrix-assisted laser-desorption/ionization time-of-flight (MALDI-TOF) MS protein analysis was performed as previously described [26,49,50]. 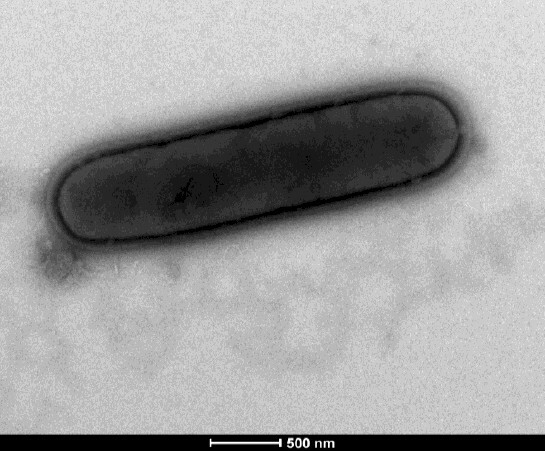 Briefly, strain EB01T was plated on 5% sheep blood-enriched Columbia agar (BioMerieux) and incubated for 24 h at 37°C. Isolated bacterial colonies were picked, and then deposited as a thin film in 12 replicates on a MALDI-TOF steel target plate (Bruker Daltonics, Bremen, Germany). The plates were allowed to dry at room temperature. Each deposit was overlaid with 1.5 µl of matrix solution containing α-cyano-hydroxycinnamic acid (Sigma, Saint-Quentin Fallavier, France) saturated with 50% acetonitrile, 2.5% trifluoroacetic acid and high-performance liquid chromatography (HPLC)-grade water, and allowed to co-crystallize with the sample. Measurements were conducted using the Microflex LT spectrometer (Bruker Daltonics). Spectra were recorded in the linear positive ion mode over a mass range of 2 to 20 kDa. The acceleration voltage was 20 kV. Spectra were collected as a sum of 240 shots across a spot. The 12 EB01T spectra were imported into the MALDI BioTyper software (version 3.0, Bruker) and analyzed by standard pattern matching (with default parameter settings) against 6,335 bacterial spectra including 210 spectra from 104 Bacillus species, used as reference data, in the BioTyper database. A score enabled the identification, or not, from the tested species: a score > 2 with a validated species enabled the identification at the species level, a score > 1.7 but < 2 enabled the identification at the genus level; and a score < 1.7 did not enable any identification. For strain EB01T, the scores obtained ranged from 1.15 to 1.60 thus suggesting that our isolate was a new species. We iadded the spectrum from strain EB01T (Figure 4) to our database. Spectrum differences with other of Bacillus species are shown in (Figure 5). 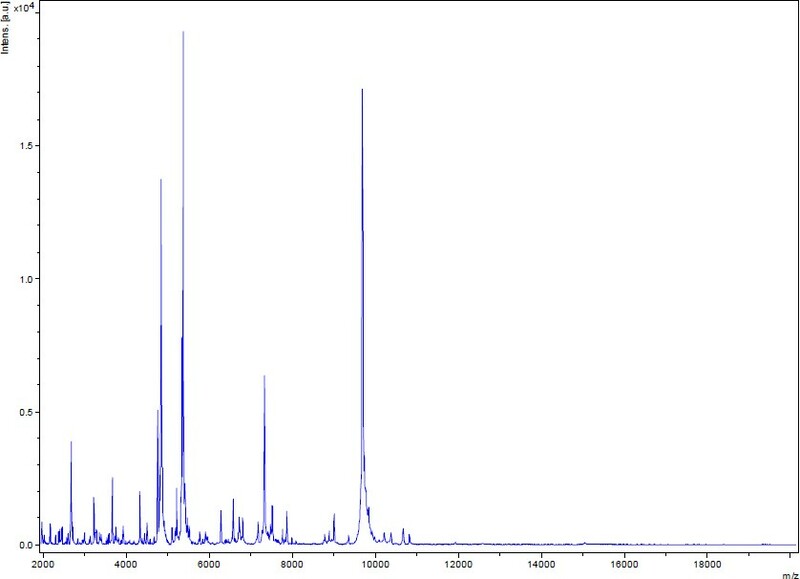 Reference mass spectrum from B. massilioalgeriensis strain EB01T. Spectra from 12 individual colonies were compared and a reference spectrum was generated. Gel view comparing Bacillus massilioalgeriensis EB01T spectra with other members of the Bacillus genus (B. weihenstephanensis, B. vallismortis, B. thuringiensis, B. thioparans, B. subtilis subsp. subtilis, B. subterraneus, B. shackletonii, B. novalis, B. niacini, B. nealsonii, B. jeotgali, B. flexus, B. circulans, B. bataviensis and B. asahii). The Gel View displays the raw spectra of all loaded spectrum files as a pseudo-electrophoretic gel. The x-axis records the m/z value. The left y-axis displays the running spectrum number originating from subsequent spectra loading. The peak intensity is expressed by a grey scale scheme code. The grey scale bar on the right y-axis indicates the relation between the shade of grey a peak is displayed with and the peak intensity in arbitrary units. 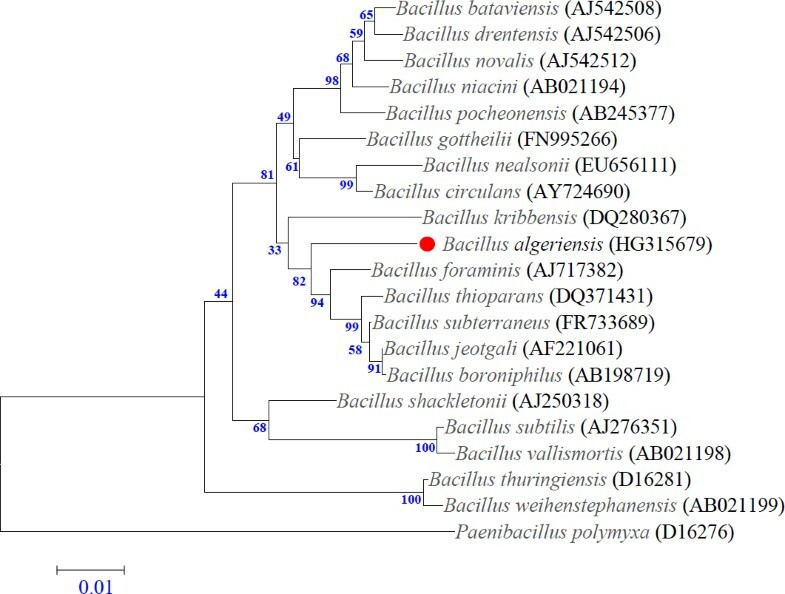 The organism was selected for sequencing on the basis of its phylogenetic position and 16S rRNA similarity to other members of the genus Bacillus, and is part of a study of Bacillus genus diversity in hypersaline lakes of Algeria. It was the 398th genome of a Bacillus species and the first genome of Bacillus massilioalgeriensis sp. nov. The EMBL accession number is ERP003483 and consists of 46 contigs. Table 3 shows the project information and its association with MIGS version 2.0 compliance . Bacillus massilioalgeriensis sp. nov strain EB01T, was grown aerobically on 5% sheep blood enriched Columbia agar at 37°C. Three petri dishes were spread and resuspended in a 2 ml sterile Eppendorf tube containing 1ml of TE buffer with acid-washed glass beads (diameter ≤106 µm, Sigma, Saint-Quentin Fallavier, France). Three cycles of shaking were performed using a FastPrep BIO 101 apparatus (Qbiogene, Strasbourg, France) for 15 sec at level 6.5 (full speed). Then, the supernatant was placed in a new tube along with one hundred µl of 10% SDS and 50 µl of Proteinase K (Qiagen GmbH, Hilden, Germany) and incubated over night at 56°C. The digested mixture was used to perform DNA extraction using the classical phenol-chloroform method. The quality of the DNA was checked on an agarose gel (0.8%) stained with SYBR safe. Genomic DNA of B. massilioalgeriensis sp. nov. strain EB01T was sequenced on the MiSeq platform (Illumina, Inc, San Diego CA 92121, USA) with a paired end and barcode strategy in order to be mixed with 7 others genomic projects constructed with the Nextera XT library kit (Illumina). The gDNA was quantified by a Qubit assay with the high sensitivity kit (Life technologies, Carlsbad, CA, USA) to 34.4 ng/µL and dilution was performed to provide 1 ng of each small genome as input. The “tagmentation” step fragmented and tagged the DNA to generate an optimum insert size of 1.6 kb, validated on a high sensitivity labchip Calliper-Perkin Elmer (Caliper Life Sciences, Inc, Massachusetts, USA). Then limited cycle PCR amplification completed the tags adapters and introduced dual-index barcodes. After purification on Ampure beads (Lifetechnolgies, Carlsbad, CA, USA), the libraries were normalized on specific beads according to the Nextera XT protocol (Illumina). Normalized libraries are pooled into a single library for sequencing on the MiSeq. The pooled single strand library was loaded onto the reagent cartridge and then onto the instrument along with the flow cell. Automated cluster generation and paired-end sequencing with dual index reads was performed in a single 39-hour run with a 2×250 bp read length. Within this pooled run, the index representation was determined to 7.1%. Total information of 2.4 G bases was obtained from a 320 K/mm2 density with 94.9% (5,757,000 clusters) of the clusters passing quality control (QC) filters. 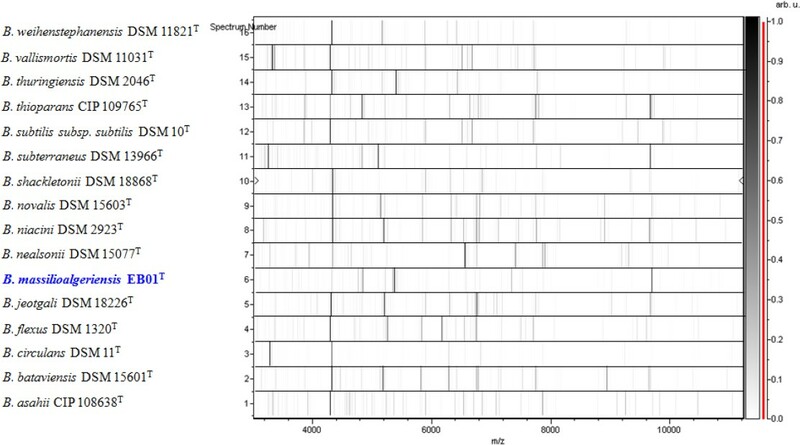 From the genome sequencing process, the 775,420 produced Illumina reads for B. massilioalgeriensis EB01T were filtered according to the read qualities and sizes using the fastq-mcf program (Ea-utils: command-line tools for processing biological sequencing data) . 714,540 filtered read sequences were kept for genome assembly. The Velvet assembler was used with different kmer values (from 51 to 95) and the best assembly result with kmer value (n=91) producing 46 contigs with sizes from 872 bp to 409,112 bp, was retained for genome annotation. Open Reading Frames (ORFs) were predicted using Prodigal  with default parameters. The predicted bacterial protein sequences were searched against the Clusters of Orthologous Groups (COG) database and the GenBank database  using BLASTP. Ribosomal RNAs were found by using RNAmmer 2.1 server [55,56] and BLASTn against the GenBank database, whereas the tRNAScanSE tool  was used to find tRNA genes. Transmembrane helices and lipoprotein signal peptides were predicted using phobius web server . ORFans were identified if their BLASTP E-value was lower than 1e-03 for alignment length greater than 80 amino acids. If alignment lengths were smaller than 80 amino acids, we used an E-value of 1e-05. Artemis  was used for data management and DNA Plotter  was used for visualization of genomic features. To estimate the mean level of nucleotide sequence similarity at the genome level between B. massilioalgeriensis sp nov. strain EB01T and seven other Bacillus species, we use the Average Genomic Identity of Orthologous gene Sequences (AGIOS) in-house software. Briefly, this software combines the Proteinortho software  for pairwise comparison and detection of orthologous proteins between genomes, then retrieves the corresponding genes and determines the mean percentage of nucleotide sequence identity among orthologous ORFs using the Needleman-Wunsch global alignment algorithm. The genome is 5,269,577 bp long with 42.22% GC content (Figure 6 and Table 4). It is composed of 46 contigs. Of the 5,193 predicted genes, 5098 were protein-coding genes, and 95 were RNAs (10 genes encode 5S rRNA, 1 gene encodes 16S rRNA, 1 gene encodes 23S rRNA, 83 genes are tRNA genes). A total of 3,217 genes (63.1%) were assigned a putative function (by cogs or by NR blast). 457 genes were identified as ORFans (8.96%). The remaining genes were annotated as hypothetical proteins (1097 genes, 21.52%). The distribution of genes into COGs functional categories is presented in Table 5. The properties and statistics of the genome are summarized in Tables 4 and 5. 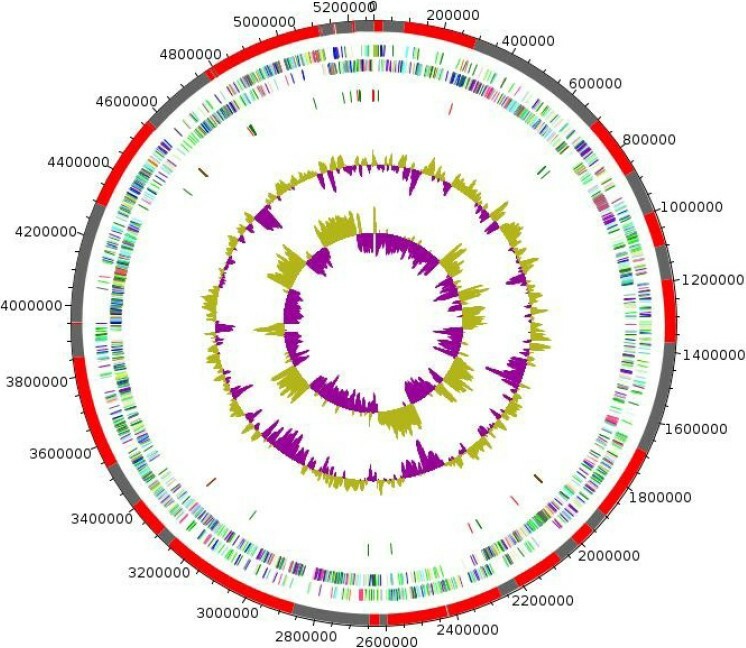 Graphical circular map of the chromosome. From outside to the center: Red and gray bars representing contigs, genes on the forward strand colored by COG categories (only genes assigned to COG), genes on the reverse strand colored by COG categories (only genes assigned to COG), RNA genes (tRNAs green, rRNAs red), GC content. The inner-most circle shows the GC skew, purple and olive indicating negative and positive values, respectively. Here, we compared the genome of B. massilioalgeriensis strain EB01T with those of B. kribbensis strain DSM 17871, B. nealsonii strain AAU1, B. bataviensis strain LMG 21833, B. subtilis subsp. subtilis strain 168, B. vallismortis strain DV1-F-3, B. thuringiensis strain BMB171 and B. weihenstephanensis strain KBAB4 (Table 6). The draft genome of B. massilioalgeriensis (5.26Mb) is larger in size than those of B. kribbensis, B. nealsonii, B. subtilis subsp. subtilis and B. vallismortis (5.05, 4.98, 4.22 and 3.88 Mb, respectively) but smaller than those of, B. bataviensis, B. thuringiensis and B. weihenstephanensis (5.37, 5.64 and 5.87 Mb, respectively). B. massilioalgeriensis has a lower G+C content than B. kribbensis, B. subtilis subsp. subtilis and B. vallismortis (42.22% vs 43%, 43.5% and 43.8%, respectively) but higher than B. nealsonii, B. bataviensis, B. thuringiensis and B. weihenstephanensis (42.22% vs 35.1%, 39.6%, 35.2% and 35.5%, respectively). B. massilioalgeriensis has more predicted protein coding genes (5,098) than B. kribbensis, B. nealsonii, B. subtilis subsp. subtilis and B. vallismortis (4,918, 4,789, 4,175 and 4,097, respectively) but fewer protein coding genes than B. bataviensis, B. thuringiensis and B. weihenstephanensis (5,207, 5,352 and 5,653, respectively). In addition, B. massilioalgeriensis shared 1,804, 1,778, 2,017, 1,768, 1,985, 1,541, 1,863 orthologous genes with B. thuringiensis, B. nealsonii, B. bataviensis, B. subtilis subsp. subtilis, B. kribbensis, B. vallismortis, B. weihenstephanensis respectively. Genomic comparison of B. massilioalgeriensis sp. 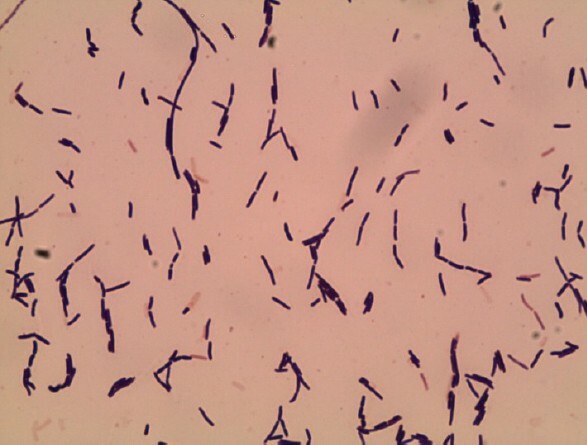 nov. strain EB01T with seven other Bacillus species†. †species and strain names, genome accession numbers, sizes and G+C contents. The average nucleotide sequence identity of orthologous genes ranges from 64.54 to 91.06% among the 8 Bacillus species, and from 64.77 to 69.33% between Bacillus massilioalgeriensis and the other compared genomes (Table 7), thus confirming its new species status. †Numbers of orthologous protein shared between genomes (above diagonal), average percentage similarity of nucleotides corresponding to orthologous proteins shared between genomes (below diagonal). Bold numbers indicate numbers of proteins per genome. B. thuringiensis (B. th), B. nealsonii (B. ne), B. bataviensis (B. ba), B. subtilis subsp. subtilis (B. subt), B. massilioalgeriensis (B. ma), B. kribbensis (B. kr), B. vallismortis (B. va) and B. weihenstephanensis (B. we). On the basis of phenotypic (Table 2), phylogenetic and genomic analyses (taxonogenomics) (Table 6), we formally propose the creation of Bacillus massilioalgeriensis sp. nov. that contains the strain EB01T. This strain has been found in hypersaline lacustrine sediment sample collected from Algeria. Description of Bacillus algeriensis sp. nov.
Bacillus algeriensis (al.ge.ri.en’sis. NL. masc.adj. algeriensis, of or pertaining to Algeria). Strain EB01T is a facultative anaerobic Gram-positive, endospore-forming, motile and rod shaped bacterium with rounded ends. Growth is achieved aerobically between 30 and 55°C (optimum 37°C), between 0% and 2.5% NaCl concentration and pH in the range of 6.5–9 (optimum at pH 7). Growth is also observed in microaerophilic atmosphere, however, weak growth was observed under anaerobic conditions. After 24h growth on 5% sheep blood-enriched Columbia agar (BioMerieux) at 37°C, bacterial colonies were smooth, light yellow with 2 mm in diameter. Cells have a length ranging from 2.4 µm to 4.9 µm (mean 3.6 µm) and a diameter ranging from 0.7 µm to 1.1 µm (mean 0.8 µm). Catalase positive but oxidase negative. Using the commercially available API 50CH system (BioMerieux) according to the manufacturer’s instructions, a weak positive reaction was observed for D-ribose, D-glucose, D-fructose, methyl α-D-glucopyranoside, N-acetylglucosamine, D-maltose, D-lactose, D-melibiose, D-saccharose, D-trehalose, D-tagatose, and hydrolysis of starch. Other tests were negative. Using the API ZYM system (BioMerieux), positive reactions were observed for alkaline phosphatase, esterase (C4), esterase lipase (C8), leucine arylamidase, α chymotrypsin, β-glucuronidase, α-glucosidase, N-acetyl-glucosaminidase and a weak positive reaction was observed for acid phosphatase. The nitrate reduction and β-galactosidase reaction was also positive, but urease and indole production were negative. B. massilioalgeriensis was susceptible to amoxicillin, nitrofurantoin, erythromycin, doxycycline, rifampin, vancomycin, gentamycin, imipenem, trimethoprim-sulfamethoxazole, ciprofloxacin, ceftriaxone and amoxicillin/clavulanic acid, but resistant to nalidixic acid. The G+C content of the genome is 42.22. The 16S rRNA and genome sequences are deposited in GenBank under accession numbers HG315679 and EMBL database under accession number ERP003483, respectively. The type strain EB01T (= CSUR P857 = DSM 27334) was isolated from sediment sample of the hypersaline lake Ezzemoul sabkha of Oum-El-Bouaghi region in northeastern Algeria. The authors thank Linda Hadjadj for technical assistance and Xegen company for automating the genome annotation process.